Cinnamon is very likely the most used spice in my spice drawer. Whether I’m using it as the predominant flavor or as a nice complement to other flavors, I find myself reaching for it again and again. 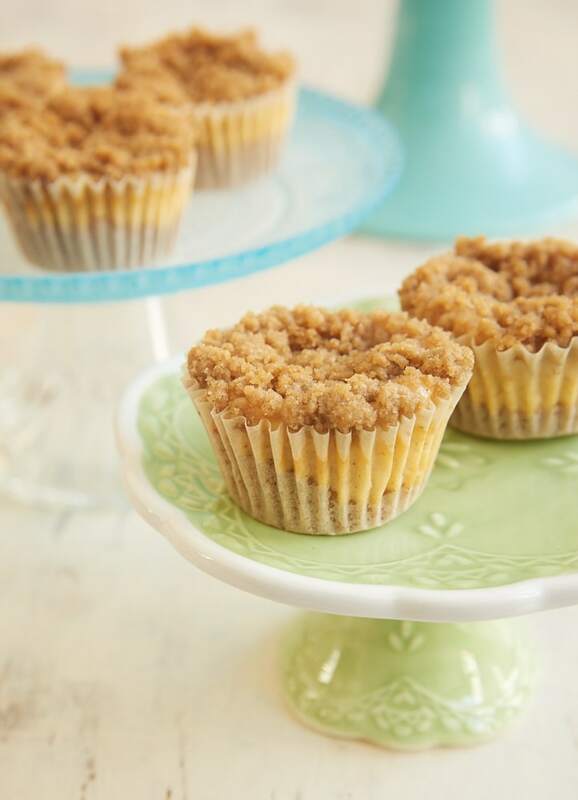 It takes center flavor stage in these Mini Cinnamon Crumb Cheesecakes. 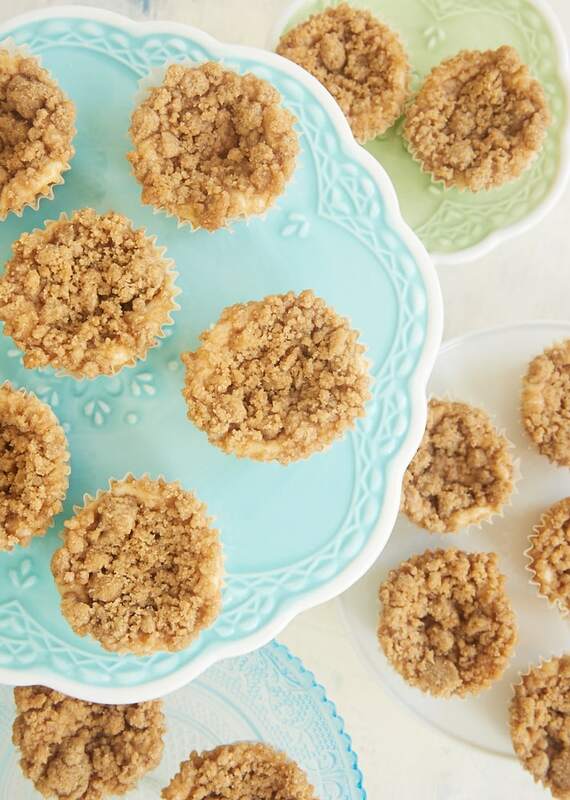 There’s plenty of cinnamon in both the cheesecake and the crumb topping to give these little treats a wonderful taste that’s tough to resist. 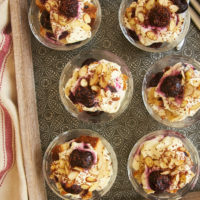 These little cheesecakes are perfectly delicious all on their own. But that crumb topping really makes them something special. 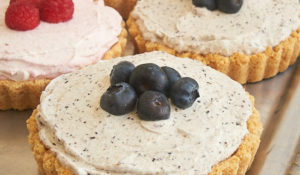 I’m a sucker for crumb toppings anyway, but there’s something so perfectly magical that happens when you add it to these cheesecakes. The flavor, the texture, the spice… It’s the whole package! Speaking of that crumb topping, there’s plenty of it here. I tend to like lots of crumb, but feel free to dial it back if you like. When topping off the cheesecakes with the crumb topping, I recommend gently pressing it into the cheesecake batter just a bit. Don’t press so hard that the crumb disappears into the batter, but just apply enough light pressure to help the topping hold on a bit better. 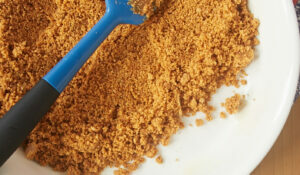 For some variety, it’s simple to swap out the graham cracker crumbs for another cookie crumb. Vanilla wafers, shortbread, pecan sandies, and more would all make a great crust companion for these cinnamon-y cheesecakes. If you want even more cinnamon flavor, try using cinnamon graham crackers. I adore mini desserts like this for so many reasons. Their single serving size means no slicing and serving. If you’re hosting a get-together, that makes things simpler for you and your guests. Also, the small size means that they bake far faster than a traditional cheesecake. Plus, they’re adorable! So many wins! 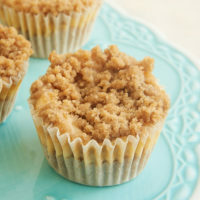 Mini Cinnamon Crumb Cheesecakes are bite-size treats full of fantastic cinnamon flavor. Preheat oven to 350°F. Line 24 cups of a mini muffin pan with paper liners. 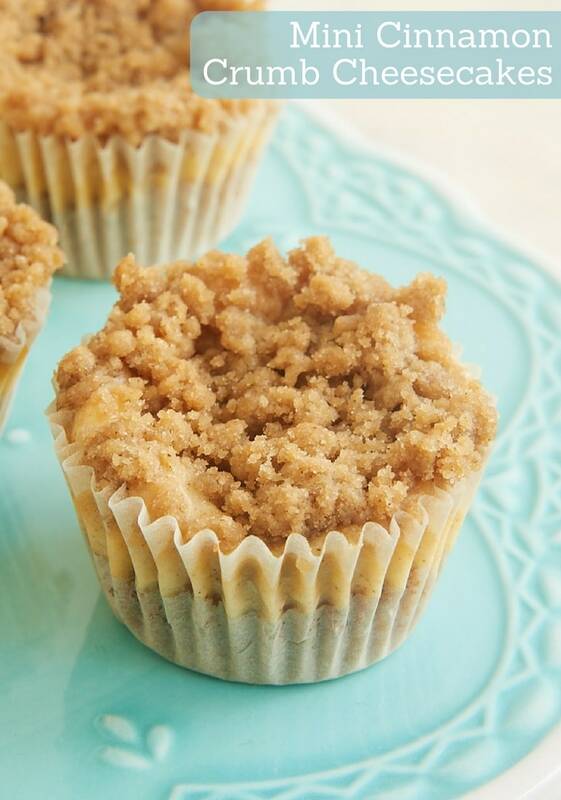 Divide the crust mixture evenly among the muffin cups, using about a tablespoon of the mixture in each cup. Press firmly into the bottom of the liners. Combine the flour, brown sugar, cinnamon, and salt. Add the butter, and mix with a pastry blender, a fork, or your fingers until the mixture forms crumbs. Using an electric mixer on medium speed, beat the cream cheese and sugar until thoroughly combined and smooth. Add the egg, vanilla, and cinnamon, and mix well. Mix in the sour cream. Divide the batter evenly among the muffin cups, filling almost to the top of each. 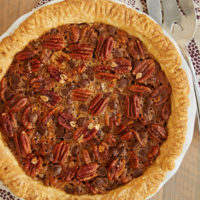 Sprinkle the crumb topping over the filling. Gently press down into the filling. Bake 18 to 22 minutes, or until the cheesecakes are set and the topping has browned. Cool to room temperature. Then cover and refrigerate at least 4 hours before serving. 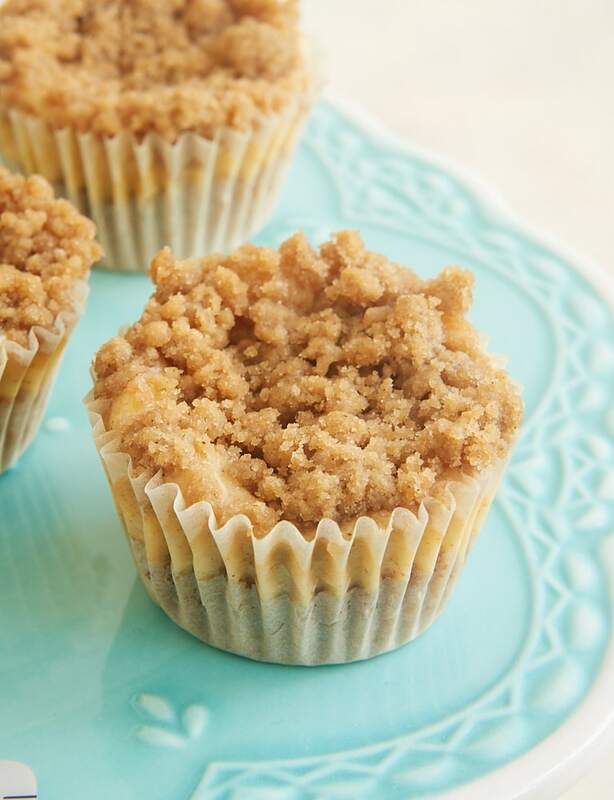 Is there some trick to making crumbs stay, well, “crumbly?” I’ve been baking for more years than I care to admit to, and I’m really good at it, but every time I make something with a crumb topping, they melt into a blob and look nothing like crumbs! 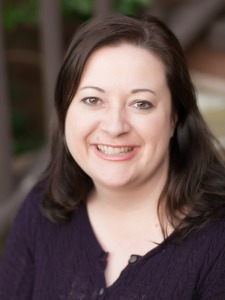 Hi, Arlene. That’s a good question. The mixing process and the temperature of your ingredients are pretty important. Mix everything except the butter together first. If you have a warm kitchen, cut up the butter and put it back in the refrigerator for 15 minutes or so before you mix it with the other ingredients. If you use your fingers for mixing, then keep in mind that your body heat will warm the ingredients, too. Don’t mix it too much. You want to see lumps of crumb. 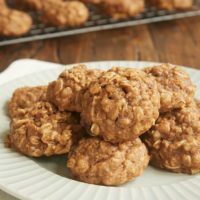 Once I’ve got a crumbly mixture, I also usually put it in the refrigerator while I make the rest of the recipe. Keeping it cold allows the mixture to harden a bit and stay together better. I hope that helps! Thanks for all the tips, Jennifer. 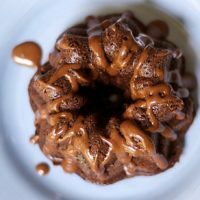 This is another winner and am going crazy compiling your recipes twice in different locations in my computer. After printing so much recipes, I damaged my printer. I’m glad you like them, Marita! 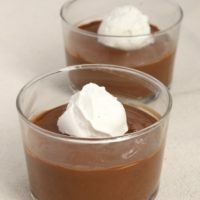 Is there a chance you could post your recipes in measurements of grams instead of cups? This helps a lot for consistency and would prevent people from getting unintended results. Hi, Hillary. 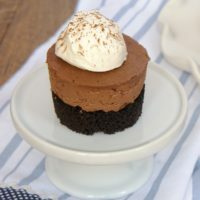 I have plans to provide measurements by weight for every recipe I’ve shared, but I don’t know when I’ll be able to do so. What’s the difference between a cupcake tin and a ” mini- muffin “? How many “cupcake” tins will this recipe produce? Muffin pans (or cupcake pans) come in a few sizes. 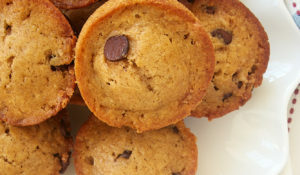 Mini muffin pans make smaller portions. Each cup has about a 2-tablespoon capacity. They’re usually available in 12- or 24-count pans.